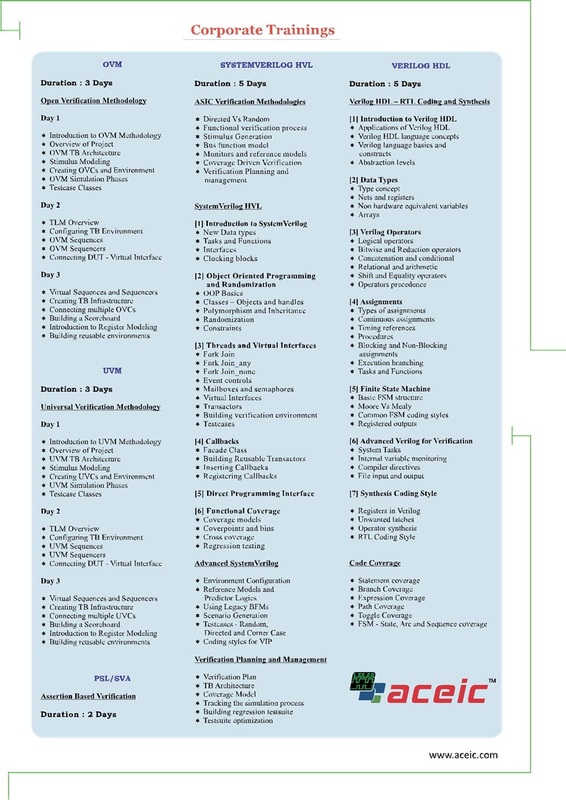 Aceic offers various Corporate Training Programs for the working professionals. Our design and verification consultants train your engineers on the advanced design and verification methodologies to make them highly productive. At Aceic, we customize the training courses based on your requirements and deliver them at your facility. A training on SystemVerilog for Verification as needed for WLAN group of Broadcom Research India Pvt. Ltd. and we found Aceic are the experts in delivered such a training. As in any organization, we also have engineers at various experience level ranging from fresher to 14 years for whom this training was needed. Their trainers had good knowledge on the subject and also has command on verification. She clarified questions/doubts raised during the training not only on the topic of discussion but also on the relevant topics and provided clear answers which was found to be extremely beneficial to the team. The training was conducted in our office and all the tutorials/labs were set one day in advance before the start day, demonstrating professional quality. Further, the examples and lab exercise were devised brilliantly which conveyed the concept without making it complicated. I wish Aceic to have continuous growth and hope that they enhances their capability to cover many more topics in Design and Verification with the same quality. Aceic delivered us ( Qualcomm ) with an excellent training on SystemVerilog and UVM for Verification which was customised to the needs of our organization. The audience was diversified from 2 to 8 years of experience and the course material was designed to address the needs of the varied experience of the audience. Their trainer had in-depth knowledge of course contents. They made sure that all the important concepts of SV and UVM are conveyed in the stipulated time. The labs provided were with appropriate examples which the engineers can apply and use while implementing in live projects. I would definitely recommend more trainings for the different teams at Qualcomm. Aceic has provided us (CYPRESS SEMICONDUCTORS) with an excellent training on SystemVerilog for Verification which is tailored to the needs of our organization. They have succeeded in creating training courses which are specific and relevant to the audience of the training – be it NCGs or experts. Their trainers facilitate in a way which allows attendees to interact, while learning skills and knowledge which can be applied to their individual roles. She has also clarified many questions raised with specific and clear answers which was found to be extremely beneficial to the team. We hope to continue receive trainings with the same quality in many more areas. My team at Sandisk attended the SV and UVM training from Aceic. The training was well organized and met the needs of the team with varied experience levels of the audience. Their trainers had very good knowledge on the subject and clarified many questions raised and provided clear answers with patience. One of the key differentiators was that the sessions were so interesting that none of the 20 attendees missed any of the sessions inspite of project pressures. The labs provided were with apt examples which the engineers can apply and use while implementing in live projects.